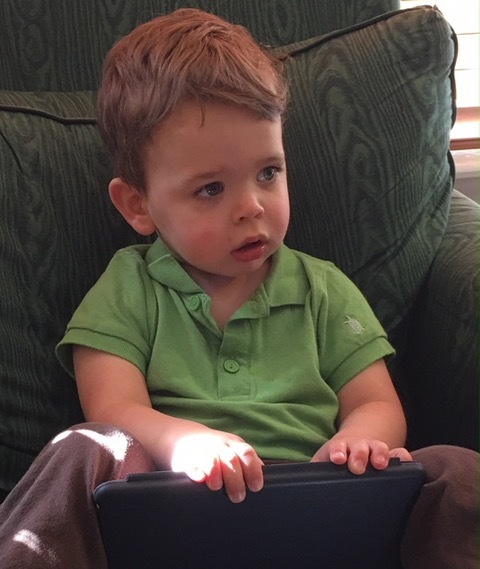 My son Wade turned 2 last week and it meant we’d finally reached one long-awaited self-imposed deadline: TV watching was fair game! Wade wearing his first “zombie” face from watching a kids’ TV show. At some point in the early days of parenting, my husband and I read, and bought into, the idea that television-watching could hinder brain development in children under the age of 2. It was something about depth perception and the confusion of looking at something flat and seeing three dimensions. It made sense to us, so we pretty much stuck by it. I’m not saying we didn’t cheat and let Wade watch some occasional Duke basketball or leave the TV on as Wade toddled in some weekend afternoon when we were just plain zonked. But we let ourselves off the hook because he normally didn’t get interested in what we were watching anyway and went on about his business. I decided to toss the question out on Facebook, figuring my veteran parenting friends would have good insights and suggestions. Whoa! My post got almost 90 comments! I had some friends telling me their kids loved Caillou and others telling me to avoid Caillou like the plague. One guy said Peppa Pig was adorable, another said she was a “beotch.” I had people admitting to loving the Wiggles, Mr. Rogers, and Barney and to “sitting there and watching” Octonauts. I had a former sportswriting colleague tell me I should let Wade watch “The Walking Dead” – to “toughen ‘em up early.” Another told me Wade must watch Braves baseball, which was only fitting because the friend was Chip Caray, a Braves broadcaster! Weaved into the suggestions and humor was some serious discourse about the merits of letting your kids watch TV at all, including some advice from my cousin to read Endangered Minds: Why Children Don’t Think and What We Can Do About it. She didn’t let her kids watch TV until they could read. It made me pause and think. And my sister-in-law posted a link to the website called Common Sense Media which I recognize already will be a great resource for trying to answer this question as they grow older. I also learned in this process that posting certain parenting questions on social media can be almost as sticky as talking politics and religion! So let me just preface this list by saying I am a firm believer in the everything-in-moderation way of thinking. I don’t plan to let Wade sit his sweet little bum in front of the TV for six hours a day. But 20 minutes to take a shower or get through a nursing session with my twins, think I’ll take my chances. And so far, after a day or two of trying this out, Wade doesn’t sit for longer than 10 minutes or so anyway. Daniel Tiger: Because a ton of friends I respect said they and their kids loved it. It’s the first children’s show I’ve watched with Wade so far and I like it. The first episode we watched was about safety, and it spoke to me. With three boys aged 2 or younger, I’m mostly concerned right now with keeping them all alive! Backyardigans: Because I’m intrigued by the name and the fact that a friend of mine said her 15-year-old daughter will still watch it. Who doesn’t want to keep their kids young at heart?! Sesame Street: Because sometimes Mama has to kick it old school. And because Wade needs to know who Big Bird and Elmo are; they’re not just characters on his Earth’s Best cracker box. 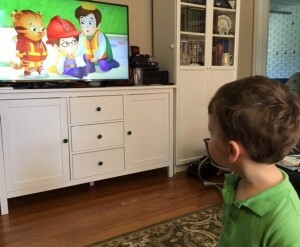 Dinosaur Train: Because I haven’t done a good job of introducing Wade to dinosaurs – we are way into trucks -and this seems like as good a way as any. Super WHY: Because I’ve been hearing about this show since my two nieces were little tots, and they are both smart and radiant young ladies! And who doesn’t love a superhero? Have ideas about shows you love and why? Message me any time! Mommy Guilt? Does it exist?